The Records of the Grand Historian (太史公書), now usually known as the Shǐjì (史記, “The Scribe’s Records”), is a monumental history of ancient China and the world finished around 94 BC by the Han dynasty official Sima Qian after having been started by his father, Sima Tan, Grand Astrologer to the imperial court. The work covers the world as it was then known to the Chinese and a 2500-year period from the age of the legendary Yellow Emperor to the reign of Emperor Wu of Han in the author’s own time. The Records has been called a “foundational text in Chinese civilization”. After Confucius and the First Emperor of Qin, “Sima Qian was one of the creators of Imperial China, not least because by providing definitive biographies, he virtually created the two earlier figures.” The Records set the model for the 24 subsequent dynastic histories of China. Unlike Western historical works, the Records do not treat history as “a continuous, sweeping narrative”, but rather break it up into smaller, overlapping units dealing with famous leaders, individuals, and major topics of significance. The work that became Records of the Grand Historian was begun by Sima Tan, the Grand Astrologer (Taishi 太史) of the Han dynasty court during the late 2nd century BC. After his death in 110 BC, it was continued and completed by his son and successor Sima Qian, who is generally credited as the work’s author. Sima Qian is known to have completed the Records before his death in c. 86 BC, with one copy residing in the imperial capital of Chang’an (modern Xi’an) and the other copy probably being stored in his home. Details regarding the Records‘ early reception and circulation are not well known. A number of 1st century BC authors, such as the scholar Chu Shaosun (褚少孫; fl. 32–7 BC), added interpolations to the Records, and may have had to reconstruct portions of it: ten of the original 130 chapters were lost in the Eastern Han period (AD 25–220) and seem to have been reconstructed later. Beginning in the Northern and Southern dynasties (420–589) and the Tang dynasty (607–918), a number of scholars wrote and edited commentaries to the Records. Most 1st millennium editions of the Records include the commentaries of Pei Yin (裴駰, 5th century), Sima Zhen (司馬貞, early 8th century), and Zhang Shoujie (張守節, early 8th century).The primary modern edition of the Records is the Zhonghua Book Company edition of 1959 (revised in 1982), and is based on an edition prepared by the Chinese historian Gu Jiegang in the early 1930s. In all, the Records is about 526,000 Chinese characters long, making it four times longer than Thucydides’ History of the Peloponnesian War and longer than the Old Testament. The “Basic Annals” make up the first 12 chapters of the Records, and are largely similar to records from the ancient Chinese court chronicle tradition, such as the Spring and Autumn Annals (Chunqiu 春秋). The first five cover either periods, such as the Five Emperors, or individual dynasties, such as the Xia, Shang, and Zhou dynasties. The last seven cover individual rulers, starting with the First Emperor of Qin and progressing through the first emperors of the Han dynasty. In this section, Sima chose to also include de facto rulers of China, such as Xiang Yu and Empress Dowager Lü, while excluding rulers who never held any real power, such as Emperor Yi of Chu and Emperor Hui of Han. Chapters 13 to 22 are the “Tables”, which are one genealogical table and nine other chronological tables. They show reigns, important events, and royal lineages in table form, which Sima Qian stated that he did because “the chronologies are difficult to follow when different genealogical lines exist at the same time.” Each table except the last one begins with an introduction to the period it covers. The “Treatises” (sometimes called “Monographs”) is the shortest of the five Records sections, and contains eight chapters (23–30) on the historical evolution of ritual, music, pitch pipes, the calendar, astronomy, sacrifices, rivers and waterways, and financial administration. The “Hereditary Houses” is the second largest of the five Records sections, and comprises chapters 31 to 60. Within this section, the earlier chapters are very different in nature than the later chapters. Many of the earlier chapters are chronicle-like accounts of the leading states of the Zhou dynasty, such as the states of Qin and Lu, and two of the chapters go back as far as the Shang dynasty. The later chapters, which cover the Han dynasty, contain biographies. The “Ranked Biographies” (usually shortened to “Biographies”) is the largest of the five Records sections, covering chapters 61 to 130, and accounts for 42% of the entire work. The 69 “Biographies” chapters mostly contain biographical profiles of about 130 outstanding ancient Chinese men, ranging from the moral paragon Boyi from the end of the Shang dynasty to some of Sima Qian’s near contemporaries. About 40 of the chapters are dedicated to one particular man, but some are about two related figures, while others cover small groups of figures who shared certain roles, such as assassins, caring officials, or Confucian scholars. Unlike most modern biographies, the accounts in the “Biographies” give profiles using anecdotes to depict morals and character, with “unforgettably lively impressions of people of many different kinds and of the age in which they lived.” The “Biographies” have been popular throughout Chinese history, and have provided a large number of set phrases still used in modern Chinese. Unlike subsequent official historical texts that adopted Confucian doctrine, proclaimed the divine rights of the emperors, and degraded any failed claimant to the throne, Sima Qian’s more liberal and objective prose has been renowned and followed by poets and novelists. Most volumes of Liezhuan are vivid descriptions of events and persons. Sima Qian sought out stories from those who might have closer knowledge of certain historical events, using them as sources to balance the reliability and accuracy of historical records. 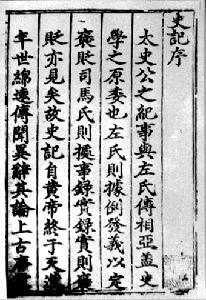 For instance, the material on Jing Ke’s attempt at assassinating the King of Qin incorporates an eye-witness account by Xia Wuju (夏無且), a physician to the king of Qin who happened to be attending the diplomatic ceremony for Jing Ke, and this account was passed on to Sima Qian by those who knew Xia. It has been observed that the diplomatic Sima Qian has a way of accentuating the positive in his treatment of rulers in the Basic Annals, but slipping negative information into other chapters, and so his work must be read as a whole to obtain full information. 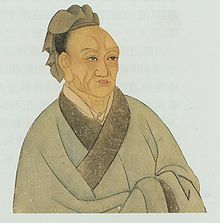 For example, the information that Liu Bang (later Emperor Gaozu of Han), in a desperate attempt to escape in a chase from Xiang Yu’s men, pushed his own children off his carriage to lighten it, was not given in the emperor’s biography, but in the biography of Xiang Yu. He is also careful to balance the negative with the positive, for example, in the biography of Empress Dowager Lu which contains lurid accounts of her cruelty, he pointed out at the end that, despite whatever her personal life may have been, her rule brought peace and prosperity to the country.